I like it the way it is. The flames look better in motion anyway (just like the smoke...you can barely see it in screen shots). Nice texturing on the torch. Looks great. Got it working on the phone. The performance is somewhere around 30-40 fps, which is better than i expected. I tweaked the shader a little bit, because it was doing calculations in the fragment shader that could be done in the vertex shader as well. That does look proper! I think you need some litter though, bones or dirt or something... It looks a bit 'clean'. If you gave me the floor and wall textures I could try to do you a low-poly drift of dirt to help break up the line where the walls meet the floor? A pile of dirt against the wall under the torch would help to mask out that harsh join. Performance is really good, I expected much less frames and looking of dungeon is very, very nice Try this texture for bow, it could look better IMHO and if fireside send me bow in another file format (something is wrong in importing to 3Ds max) I will look at UVs and merge skin and wood1 textures in to one. @Thomas. : I've replaced the texture. It looks better, but it loses some detail because i'm only using 64*64 for the bow. Me too, especially because it's all tile-based, i.e. 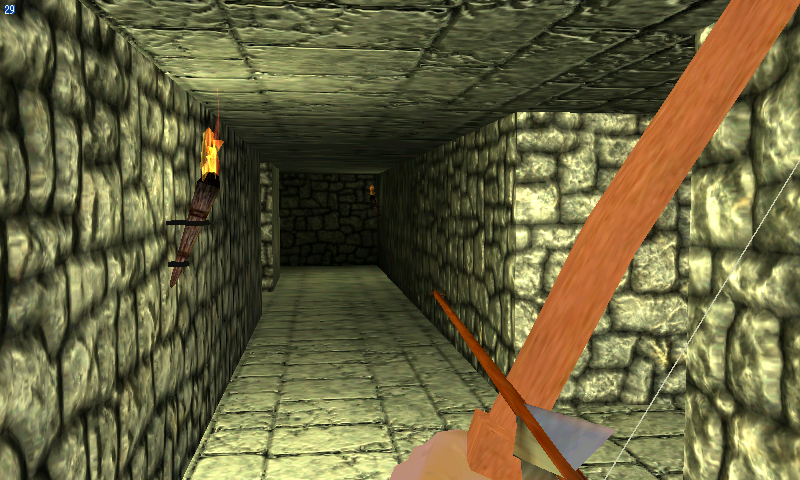 there's not one large dungeon object but the whole things is created out of basic building blocks at runtime. What did you want it in? The hand and the model are together, sort of, but separate objects in Blender. I think it would look a little better if the handle were textured a little different from the bow, but it looks all right to me to be honest. Plus there are frames, so it's more than one object. I don't know how that works, though. I can't remember which frames I sent, so it might end up a little different. The start frame would be the same. 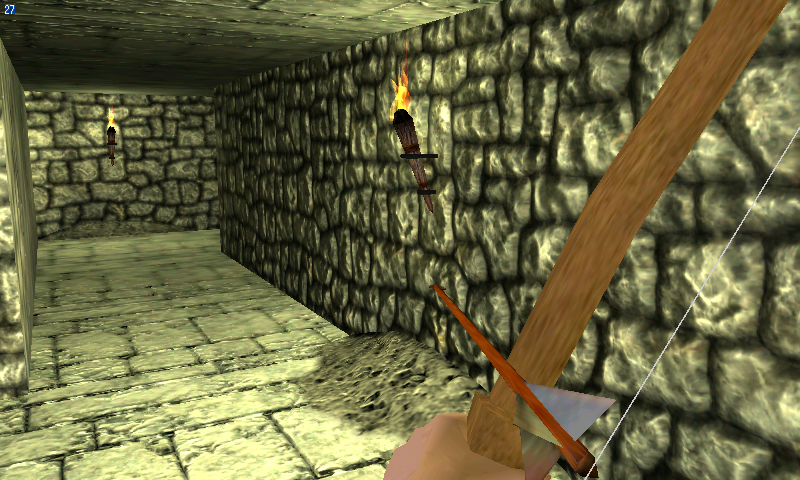 I think there will be plenty of modeling and texturing when he puts objects in the dungeon. He might want to replace the bow for a final presentation, but it is a telephone game and vertices need to be kept low. You're kind of giving me a complex here. I don't think it's too bad. I'm not the best at texturing, though. and here's the model (26 polys). I haven't actually tried it in jPCT - will the transparency be a problem? I tried to make it as re-usable as possible for different scales or wall/floor combos. Also there's more than half of the dirt.png texture unused. I wondered about some ceiling stuff to use it up - tree roots maybe? Cobwebs? Cobwebs might look cool. I could animate them with a simple vertex shader. I would like try the dirt pile tomorrow...but i can't unzip it. I tried three different zip-programs, but none of them can unzip that file. I download the file two times, same result. Unzips here ok.. NM, try this one. I'll have a play with cobwebs. It looks really nice. About the only thing that stands out a little is the very straight line between floor and wall and ceiling and wall. Don't know if it's possible, but a bevel on the top and bottom of the wall would help I think, or possibly leave a slight crack.